To close out 2016, Liberty ended a five-game losing streak against Charleston Southern with an impressive 81-70 win, Saturday afternoon. The Flames (7-8) made a season-high 15 three-pointers as they conclude their first weekend in the Big South with a 2-0 record, Liberty’s best start in conference play since the 2010-11 season. The win was Liberty’s first at the Buc Dome since Feb. 9, 2012. The Buccaneers (4-9, 0-2 BSC) came into the game with the third-best scoring offense in the conference, but were held to nearly six points less than their season average (75.2 points per game). Liberty also forced eight turnovers during the afternoon contest, converting the giveaways into 15 points. The Flames finished the game shooting 52.2 percent from the floor (24-of-46), including 53.6 percent from three-point range (15-of-28). Liberty’s 15 three-pointers fell two shy of tying a program record, set last year against Gardner-Webb (17 on Feb. 27). Liberty also benefited from 18-of-22 shooting from the free throw line (81.8 percent) and finished the game with 17 assists to only five turnovers. Charleston Southern finished the game shooting 48.1 percent from the field (25-of-52) and 38.1 percent from three-point range (8-of-21). For the fourth straight game, Ryan Kemrite led Liberty in scoring with 19 points, moving the junior into Liberty’s top 50 scorer’s listing at No. 48 (599 career points). Kemrite, who scored 12 of his 19 points during the first half, finished the game hitting 6-of-11 attempts from the floor, including 4-of-9 from three-point range. The starting backcourt of John Dawson (16 points, five rebounds and four assists), Lovell Cabbil (11 points, three assists and two rebounds) and Georgie Pacheco-Ortiz (four points, five rebounds and five assists) combined for 31 points, 12 assists and 12 rebounds. Kemrite got things going for Liberty on offense with back-to-back three pointers on the first two possessions to take and early 6-0 lead. Dawson followed Kemrite’s lead as he made back-to-back three’s as well as Liberty went 4-4 from beyond the arc in the first four minutes of the game to take a 14-8 lead. The Flames did not miss a shot until the 15:13 mark in the first half. Charleston Southern also was efficient from the field, making six of its first nine attempts to stay within reaching distance of the Flames. 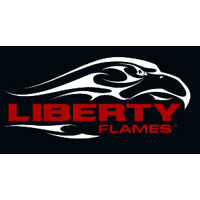 As the first half continued Liberty hit a wall on offense with a scoring draught that lasted three and a half minutes. Midway through the first half the Buccaneers went on a 6-0 run to come within three points (26-23) of the Flames. The bench of Charleston Southern delivered nine points in the first 20 minutes to help tie the game at 28-28 with 4:30 left in the half. Liberty retook the lead immediately off a layup by Pacheco-Ortiz and Brock Gardner nailed a pair of three pointers to put the Flames back up 39-30. After Liberty relied on the three-ball early in the first half and to close it out, the Flames looked to it once again draining four threes in the final four minutes. Liberty would go into halftime with a 42-32 lead. The Flames ended the first half with 10 three pointers, 12 points off the bench while forcing six turnovers. Kemrite was the only player to reach double-digit scoring in the first half with 12 points. It was a game up of up-and-downs during the first 10 minutes of the second half. The Flames struggled offensively while Charleston Southern went on a 7-0 run over the course of four minutes to come within five points (44-39). After CSU’s run, the Flames settled in on defense and did not allow the Bucs to score for three minutes, to open up to a 48-39 lead. The Flames then did not make a field goal during lasted four minutes but the team’s defense remained solid as Liberty held onto a 52-46 lead. Cabbil started to pick it up offensively in the second half with two three-pointers during the span of four minutes to help extend Liberty’s lead to 58-46 with 10 minutes left in the game. Liberty continued to rely on its defense, not allowing the Bucs to score from the 6:13 mark, until a free throw by Javis Howard to put Liberty up 69-58 with 3:31 left in the game. The Flames will have a quick turnaround in Big South play as they head home for two games beginning on Tuesdayagainst UNC Asheville. Tipoff is set for 7 p.m. at the Vines Center, Liberty’s first home game since Dec. 16.